This came out to be a nice mezuza...except for the erasure of the yud and vov in v'hayu (l'totafos). 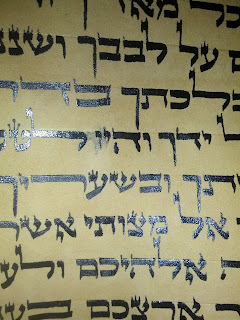 The impression of the yud and second vov are still visible, even though there is no actual ink left. The Mishna Brura quotes a Pri Megadim who says that it is a חשש פסול אפילו בדיעבד when there remains a רושם דיו. 1. Is this the case that the Pri Megadim is referring to? 2. Do we pasken like this Pri Megadim? NO, there is no other dyo under the letters. Not that this is a proof, but in the פאר הלכה (i.e. Picture משנה ברורה) it definitely portrayed the פרי מגדים as referring to a case where there was no actual ink left and just an impression, as in this case. I'm curious about your lamedim. Is there a particular reason why the regel resembles more ktav vellish being a slanted regel instead of a horizontal moshav and why the right kotz is on the right side of the Rosh instead of next to the left one? 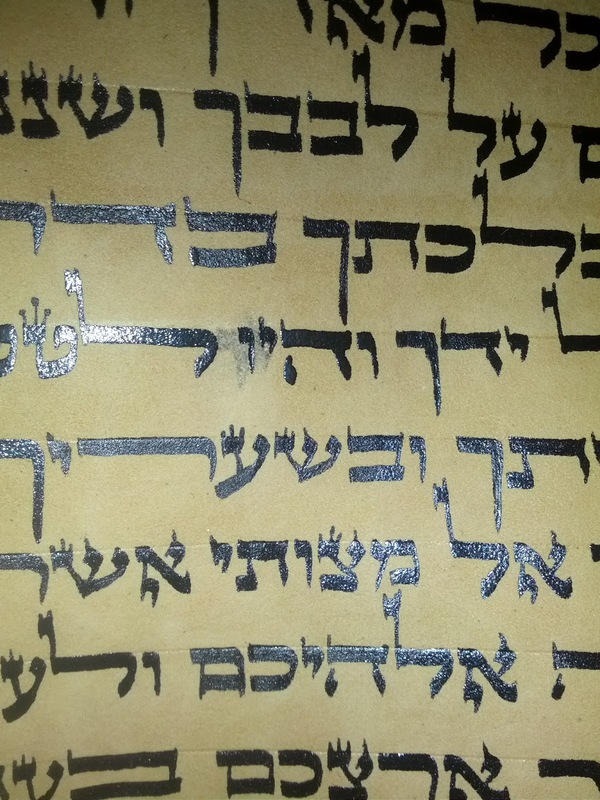 I have seen and heard about tzadis written like that in ktav ari zal before - I believe there is a valid Shita though I don't recall any sources at the moment. 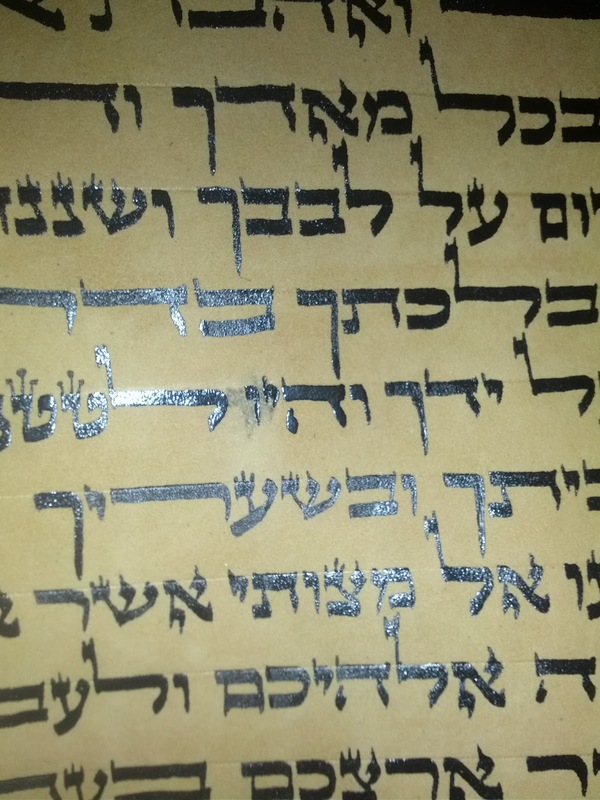 Regarding the tet, from memory I think R Chaim Vital is the source for making the tet like a normal b"y rosh, I don't remember the source for making it a Rosh of a vav. The Ksav is meant to be Beis Yosef. The Dikdukdim are according to ספר תמונת האותיות by R' Mordechai Hes and ספר פתשגן הכתב by R' Mordechai Slushtz. Correct. 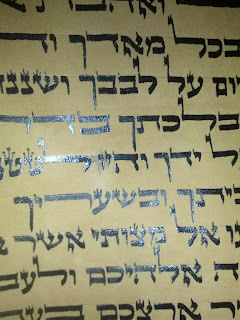 The Shaatnez Getz letters do not come out mamash from the side as in Arizal, but slightly indented, see תמונת האותיות and פתשגן הכתבas R' Yankev pointed out. The kotz coming out of the bottom is just to ensure that there is a noticeably sharp point at the bottom left to be choshesh for the shittos that that is the pshat in the tagei shaatnez getz. As for the lameds, the pashtus in the Alpha Beisa when in says that the zanav of the lamed in כפוף לפניה היטב is not that it have a flat moshav but that it curve inward significantly and is not mamash a khof, but resembles a khof al pi sod, again see the above-mentioned sewforim. This is almost certainly the way that the Vilna Gaon understood it as he compares the zanav to the right head of a tes. והאבנ"ז שמחמיר להצריך הבחנת תינוק, במקרה זה ברור שהתינוק לא יתבלבל מן הרושם של האות המחוקה. What are you basing your understanding of the Alpha Beita on? The Beis Yosef brought by Mishnat Sofrim also has that lashon and he clearly explains that the moshav should indeed be pulled flat like a kaf - the only dispute is whether only to pull it all the way to the end of the gag (Radbaz, Torat Chaim) or only a little (Kehilat Yaakov). Indeed the Mishnat Sofrim brings that Kehilat Yaakov heard this shita in the name of the GRA himself and that this is how we are noheg today in ktav beis yosef. I also think that it makes more sense that this is the GRA's opinion because the right rosh of the tet has to have kefifut harosh and is pulled around like a kaf just that is it round and not flat, but it isn't a straight diagonal like your lamedim. Are there any acharonim that bring down to write a beis yosef lamed like you have understood? My second question was about putting the right tag of the lamed on the right side and not on the left side next to the left tag. Is there a source for this? (admittedly, my teacher told me once in the name of R Menachem Davidovitch that this would also be considered mehudar but I don't think he gave a source or a reason) But I wouldv'e thought a lack in hiddur since the beis yosef and MB write for the rosh lamed to be a vav and specifically round at the top right. First off, when reading the Alpha Beisa it is very important to differentiate between the practical writing of the letter, which he describes in the first Alpha Beisa, and the r'mazim behind them, which he elaborates on further in the 2nd, 3rd, and 4th. As far as the straightness of the zanav, this mezuza was written a couple of months ago and I have since begun to make the zanav more rounded on the bottom, but not at all flat. As far as the tag, if you look in most of the old ksavim from Europe the tag was at the corner of the head mamash. Once again, being makpid on rounding the corner so that it looks mamash like a vov is mainly a product of taking the r'mazim of the Alpha Beisa overly (לפע"ד)literally. A similar (but much more problematic) style has developed (very recently and seems to have begun with R' Nesanel zt"l) is making the regel of the kuf a nun pshuta mamash. The Alpha Beisa says that it is "like" a nun pshuta and it's head is עב ומתמעט. Nowhere does he say to make it a nun pshuta mamash! This gets into shaylos of מקצת האות דומה לחברתה, which is a חשש פסול. In the ספר תמונת האותיות he says that he was advised by the גדולי הפוסקים that although it is problematic, it is very difficult to completely uproot this practice and they therefore recommend a compromise of sorts, עיי"ש. As I'm sure you're aware, the minhag by many sofrim before very recently was to make a ball on top, which also was m'ramez to a nun pshuta, but not to make a nun pshuta mamash. I could go on and on, but I think I've ranted enough. More important than my ranting though is that I hope no one takes anything I'm saying personally and while I'm sure many of you disagree, may we do so with mentshlichkeit and all be zocheh to a גמר חתימה טובה!!! Thanks for the lengthly discusion in regard to the moshav of lamed, it is very interesting and needs more עיון היטב. "A similar (but much more problematic) style has developed (very recently and seems to have begun with R' Nesanel zt"l) is making the regel of the kuf a nun pshuta mamash. The Alpha Beisa says that it is "like" a nun pshuta and it's head is עב ומתמעט. Nowhere does he say to make it a nun pshuta mamash! This gets into shaylos of מקצת האות דומה לחברתה, which is a חשש פסול." This rosh [of the regel of the kuf] is mentioned also in Mikdash Me'at. I personaly dont think there is any chashash of מקצת האות דומה לחברתה in this case.